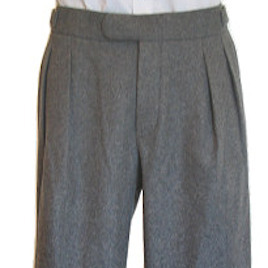 Grey flannel trousers ? for more than half a century the staple informal leg-wear of the well dressed gent. Yet today it seems extremely hard to find a decent pair in a traditional full-cut style. As such I had Indy copy these from a pair of vintage trousers I have in my collection, and am extremely happy with the result. The attention to detail is superb ? I hadn?t even noticed that the originals had a watch pocket until I tried on the copies. The heavy weight fabric drapes wonderfully, and gives a great vintage silhouette. All-in-all a versatile and comfortable pair of trousers that have quickly become one of my favourite items of clothing.